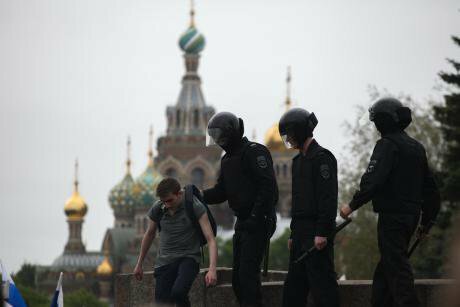 12 June: Russian police officers detain a participant of an unauthorised rally in St Petersburg. (c) NurPhoto/SIPA USA/PA Images. All rights reserved. .In St Petersburg, in Police Station No. 15 a detainee was forced to undress to their underpants, while in Police Station No. 24 detainees were beaten (and one detainee was held in a cold and damp cellar). 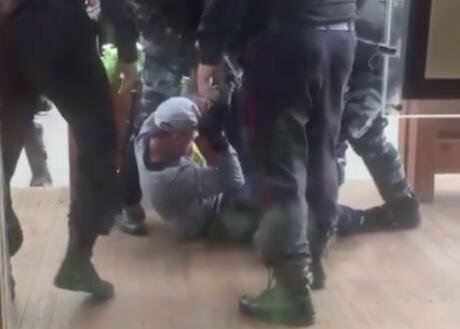 In Moscow’s Alekseevsky police station three people spent the night on the street – there was no room for them in the police station itself. This is only a short list of such violations. In the near future we’ll publish a detailed report. At least 350 court hearings have already been held in St Petersburg. More than 100 people have been sentenced to terms in jail for periods of from one to 15 days. The rest have been fined sums of between 3,000 (£40) and 15,000 roubles (£200). In Moscow things are not so tough: so far we know of 11 people who have been jailed (although Alexei Navalny, has been given a 30 day detention sentence), while the main body of court cases is yet to be heard.